The time is here.... and because sold out last year's Cold War Bunker Party, we're been looking for a bigger space, and now we've round it: 1000 ppl, 6m high ceiling, 8 DJs, and looking into getting a drunk boxing ring installed. No tickets sold at the door like last time! 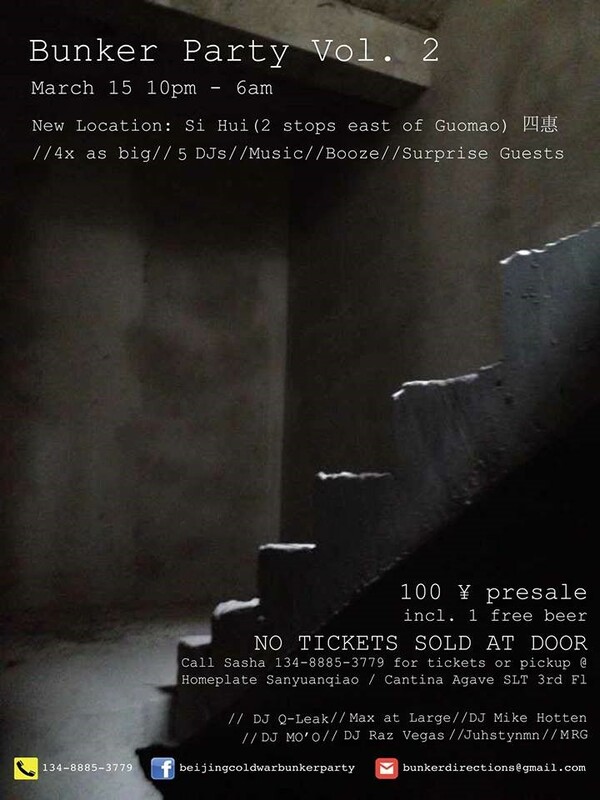 100 rmb presale, call Sasha for tickets at 134-8885-3779 or pick them up at Homeplate sanyuanqiao or Cantina Agave sanlitun 3F. MARCH 15 from 10pm - 6am, our local DJs will be playing the best underground beats: DJ Q-leak, Max at Large, DJ Mike Hotten, DJ MO'O, DJ Justnstyn, MRG and surprise guests! Add me on Wechat for more info! Facebook: beijingcoldwarbunkerparty, pictures and videos from the last party!